You might be surprised by what you see. Our home’s roofing bears the brunt of the elements wear and tear – and without proper maintenance, these factors can take a toll on its appearance. Reclaim your property’s curb appeal and secure your roof’s long life… And let Superior Pressure Washing do the work! Our team appreciates how important your roofing is to the safety of your home. That’s why we stick with a soft wash technique that gently removes mold, mildew, and other growth from your home without exposing it to damage. Traditional methods can inflict more harm than good on your home, which is why we only treat our client’s roofing with this low pressure technique. Your roof can become a breeding ground for mold spores, moss, and other organic matter that, if left unattended, can pose as much of a health risk as an eyesore. We appreciate how important it is to eliminate this hazard, both for the safety of your family and your home. As such, we meticulously attend to the surface to ensure that the surface doesn’t just look good but is also free of any unwelcome debris. If your roof is in need of some serious TLC, then you know who to call. 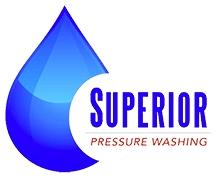 Schedule your appointment with Superior Pressure Washing today!